+ - What Is the Economic Science Institute (ESI)? 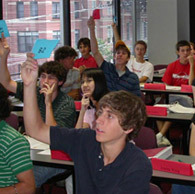 Started as an alternate, more hands-on method to economic education, the Economic Science Institute at Chapman University is an academic center that uses the laboratory method of inquiry to study the role human institutions play in creating social rules and order, and also builds and tests market and management systems. ESI’s research spans the fields of accounting, economics, finance, information systems, engineering, psychology, neuroscience, computer science and philosophy. + - What Is Experimental Economics? Traditionally, economists relied heavily on mathematical abstractions to understand how people behave and how markets work. But Vernon Smith recognized that markets in natural environments are dynamic and operate in specialized institutional settings. He began laboratory work to determine if those mathematical abstractions actually described market behavior, and whether they could be tested using a scientific approach. This method has become known as Experimental Economics and earned Smith the honor of Nobel laureate and Chapman the honor of having a distinguished institute working at the frontiers of economic science. + - Why Use Experimental Economics in the Classroom? One of the challenges for economics students is that classes often start with theory, dealing in abstract principles that aren’t intuitive. In our courses, students start by participating in experiments related to markets and other exchange settings before discussing the theory behind the experiment. 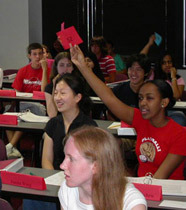 After an experiment is complete, students have the opportunity to observe and discuss how well their own behavior – before they had any knowledge of the theory – conforms to the economic principles being examined. Sometimes traditional economic tools do an excellent job of organizing and explaining their behavior, and sometimes they don’t. Either way, the class explores the fundamental question: why? + - Want to Read More About Experimental Economics? Students looking for extra cash can volunteer to participate in ESI experiments.